You’ve seen bits about our greenhouse before. I need to devote a post to it and show you just how it all came together. My Hurb is THE MAN when it comes to building awesome structures around the ranch! But anyway, have to share this kinda funny story with you about when I was trying to get things ready to plant this Spring! 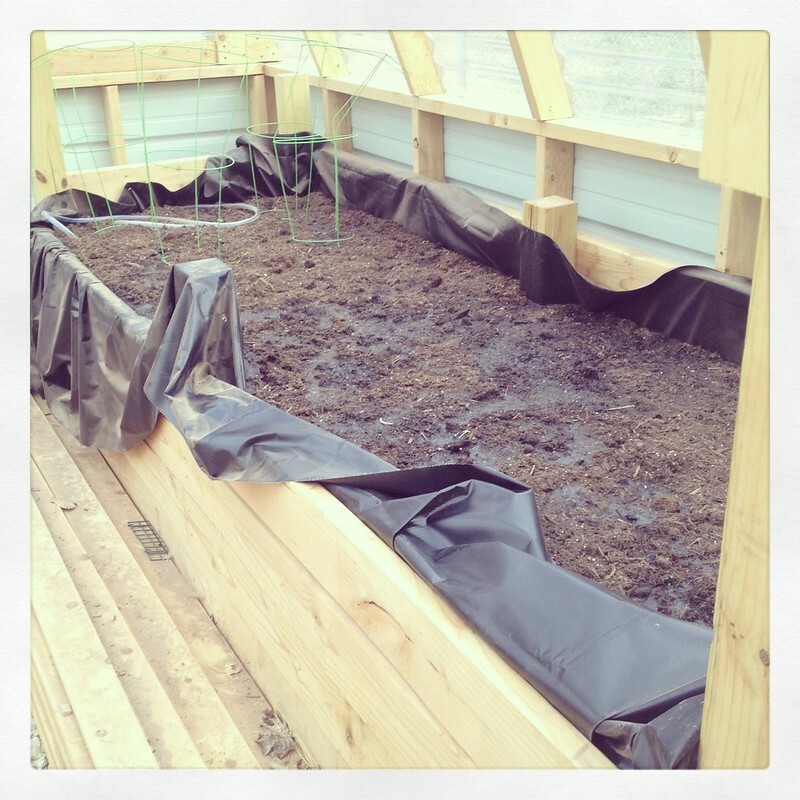 Stuart did a lot of reading and research on the best way to create the raised beds in our greenhouse. Water is an issue out here! Like… big! And we wanted a way to do some kind of drip irrigation or something in order to not “have” to soak the beds each day with the hose. 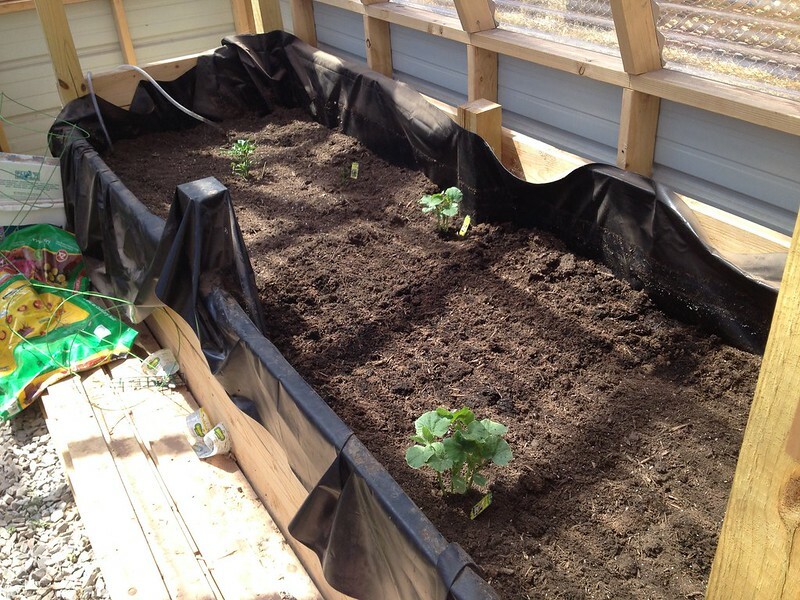 Well, the thing we ultimately ended up doing was, I’m sure it has a name, but I forget it, to put large piping under the soil so that the beds are essentially watered from the bottom up. There’s a little pipe that sticks out and every so often you take the hose, fill the pipes and leave it for a few more weeks. Good concept, and it works too! However, I was unclear on just how much to “fill” the pipes since last year when this whole system was being set up, I was staying with our twins who were in the hospital because of being premies. Fast forward to this spring and I just left the hose going in there for uh… too long… since I expected I’m not sure what to happen that would “signal” that the pipes were full. Sadly that “signal” never came and I went out there to check on it and we had dirt soup. Yep, I totally flooded the bed!! In fact it was mere centimeters from completely overflowing!!! Here’s the carnage! I evened out the “muck” that was left and added a little dry dirt to the top and then popped in a few plants. They are actually loving it in there!! Well, the cucumbers are anyway! The peppers and watermelon plants still haven’t made up their minds what they want to do, but I’m pretty excited about the growth I see on the cucumbers!! Even a couple of the seeds I planted have sprouted! Yay! Stuart says that we may have to dig it all out and redo the bed because I disrupted the “wicking layers” and it may not work like it’s supposed to. So… more work, but it’s okay. We’ll see if I can grow anything in it first and if it needs maintenance after the season, we can do that too.